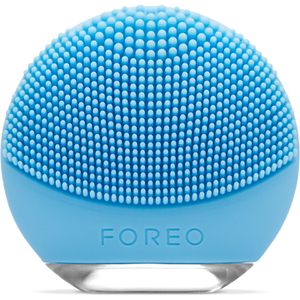 Treat and transform skin with the FOREO LUNA™ play, an ultra-portable facial-cleansing device designed to provide a professional standard of skincare with its invigorating one-minute ritual. Perfect for all skin types, the facial brush inspires healthier-looking skin; helping to clear and clarify for a more luminous complexion. 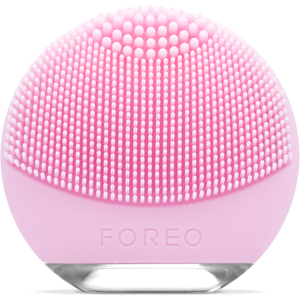 The perfect introductory product for FOREO beginners, the travel-sized device is the smallest in the range (the same size as a cotton pad!) and offers up to 100 uses*. Combining T-Sonic™ Pulsation Technology from the LUNA™ mini 2 with FOREO'S signature, non-porous silicone touch-points, the device gently yet effectively cleanses and exfoliates with a single intensity, dual-zone range; its thicker touch points at the top perform an intense clean to help unclog pores and lift away dirt, oil and dead skin, whilst softer, thinner points at the bottom gently cleanse sensitive or normal skin, and larger areas such as the cheeks. Flexible and easy to use, the silicone 'bristles' are ultra-hygienic and resist bacteria build-up to keep skin fresh and clean. Easy to operate and super-portable, the device combines the high-tech power of the LUNA™ range with the ease of a single intensity. Experience simple cleansing without the need to recharge. Skin appears bright, refined and more even in tone. 100% waterproof, the device is safe for use in the bath or shower. Non-rechargeable battery: up to 100 uses. Travel-friendly size – same size as a cotton pad. *Approximately 1-2 months when the device is used twice a day. Remove all makeup, then dampen face and apply cleansing product. Wet the LUNA™ play’s brush surface. Turn on the LUNA™ play by pressing the button once, and begin cleansing using gentle circular strokes. Use extra care around the under-eye region using light outward, strokes. The entire cleanse should take one minute. I love this product it has changed the way I wash my face and my face is so much softer. I feel clean after using this. I don’t know why it took me so long to use this but I am never stopping.